Rahul Yadav Fired As Housing CEO! 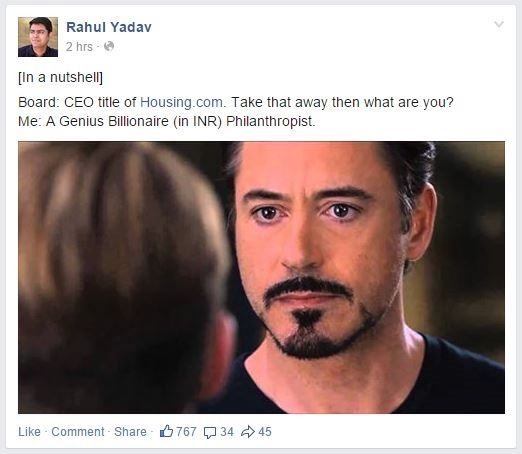 Finally, the Rahul Yadav & Housing Saga has come to a close! Online and offline media have been buzzing with Rahul Yadav antics for over 4 months now and finally those antics have led to his ouster. The ET story published couple of days earlier had mentioned that after the ouster, he may remain in housing and look after product development, however, the official statement given by the company says that “ Rahul Yadav will no longer be an employee of Housing and be associated with the company in any manner, going forward!” . The Housing board was unanimous in their decision. There has been no word by the board in regards to the rumours of classifieds portal Quikr acquiring Housing. According to Economic Times, it was not discussed in the board meeting. Even after the ouster, Rahul Yadav seems to be quite defiant. Here is what he posted on Facebook, probably after he was fired! I think, irrespective of how he acted in the best few days/months, this guy will make a dent in the industry somewhere.He has every potential and ability to make things happen in some or the other way! I don’t deny that he has ‘may be’ used a wrong way but than, if things are working for him in that way, he choose that way as simple as that!